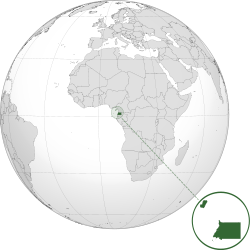 Equatorial Guinea is one of the smallest countries in the African continent. It has an estimated population of 1,622,000 inhabitants (source: BEAC 2014) and covers an area of 28,051 square kilometres in Central Africa. Its mainland, also known as Rio Muni, borders Cameroon to the north, Gabon to the south and east and the Gulf of Guinea to the west. Its insular area includes the islands of Bioko, Annobón, Corisco, Elobey Grande and Elobey Chico in the Gulf of Guinea. Equatorial Guinea has experienced profound economic and social changes after the discovery of oil in its territorial waters. From being an impoverished economy , largely agricultural, it has become the leading oil producer in the CEMAC zone and the third largest oil producer in sub-Saharan Africa after Nigeria and Angola. Its GDP has increased tenfold in ten years (1999-2009). The revenues generated from the oil sector have contributed to improve the basic infrastructure of the country. The building of roads, schools, hospitals and social housing has made the construction sector become the second largest contributor of the GDP. Meanwhile, the contribution to GDP of other activities, such as agriculture, fishing and forestry, has declined significantly. Currently for the government of Equatorial Guinea it is a priority the development of these sectors. The country's main challenge is to use these flows of substantial revenues efficiently to diversify the economy. The economic and political stability in Equatorial Guinea is attracting growing interest from foreign companies, especially to extract oil deposits. This provides a favourable medium-term forecast, especially in projects of extraction of natural gas. The country also has untapped deposits of titanium, iron ore, manganese, uranium and gold. Both the mainland and the island of Bioko have a modern road network. Malabo, the capital, is located on the island of Bioko and is the largest port in Equatorial Guinea. Other major cities are Luba on South Bioko, Bata and Ebebiyin on the mainland. The incipient city of Oyala, currently under construction, is destined to become a new economic and financial capital in central Africa. The value of exports of Equatorial Guinea is significantly greater than the cost of imports. United States is the largest trading partner in the country, followed by China, Spain, Italy and France. The main exports are oil, methanol, timber and cocoa; the main imports are petroleum equipment and other machinery, food and beverages. Equatorial Guinea continues to rely heavily on foreign investment in the hydrocarbon sector.